Graveside funeral services for Shirley Geneva Flanders Brown, age 83 will be held at 2:00 P.M. Wednesday, January 16, 2019 at Pleasant Springs Baptist Church Cemetery. Mr. Allen Wynn will officiate. Mrs. Brown was born September 21, 1935 in Dublin, Georgia. She was the daughter of the late Joseph F. and Claudia Senn Flanders. She was also preceded in death by her husband, Billy Edward Brown, and by a daughter, Barbara Graham, and a sister, Wadean Jones. 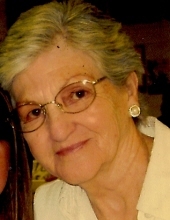 She was a member of Calvary Baptist Church. She was a retired seamstress for Imperal Men’s Shop. Mrs. Brown passed away Monday, January 14, 2019 at Serenity Place. Mrs. Brown is survived by her 6 sons, Julian Graham, Kent Graham, Billy Edward Brown, Jr., Ricky Brown, Jerry Brown, and Gary Brown, 5 daughters, Amy Carter, Dot Martin, Susan Haywood, Cindy Chubb, and Patsy Self, a brother, Clifton Flanders, 2 sisters, Kay Payne, and Patsy Cauley, 12 grandchildren, and 9 great-grandchildren. Pallbearers will be Nathan Flanders, Jason Page, George Chamberlain, and Billy Edward Brown, Jr. In lieu of flowers the family asks that donations be made in memory of Mrs. Brown to Serenity Place at 504 Parker Dairy Road, Dublin, GA 31021. The family will receive friends immediately after the graveside service at the home of Clifton Flanders at 1075 J.F. Flanders Road, East Dublin, GA 31027. To send flowers or a remembrance gift to the family of Shirley Geneva Brown, please visit our Tribute Store. "Email Address" would like to share the life celebration of Shirley Geneva Brown. Click on the "link" to go to share a favorite memory or leave a condolence message for the family.